One of the remarkable things about Donald Trump is that, unlike many previous presidents, little of what he said on the campaign trail has been repudiated in the Oval Office. He pledged to abandon the Paris climate accords, case in point, and has now done as promised. This has occasioned much hand-wringing among the pact’s promoters and media sympathisers. The ABC website, for example, very quickly posted no less than five reports on the betrayal of Gaia and Obama’s virtuous green legacy. One guesses the national broadcaster drew some slight solace from being able to report plans for yet another mega-wonder windfarm and the Turnbull government’s reiteration that it remains very nearly as green as Adam Bandt’s bicycle seat. South Australians, buy more candles. Still, one can hope that when the for-the-moment Prime Minister goes — be that by knife* or his own volition — the pretense that handing Australian tax dollars to UN kleptocrats will lower global temperatures by any measurable fraction of a degree might vanish with him. Certainly there are encouraging signs. Only yesterday in Senate Estimates (the June 1 transcript will appear here, sooner or later) a pair of Liberals exchanged terse unpleasantries about anthropogenic climate change and its purported consequences. Former Howard government era minister Ian Macdonald sided with One Nation sceptic Malcolm Roberts while fellow Liberal Arthur Sinodinos insisted, somewhat incoherently, that Australia’s ongoing devotion to the Paris pact’s financial overheads would do much to tame our high-and-forever-rising energy prices. In America the debate will continue. One cannot kick over a trough without hearing squeals. But the exit decision has been made, as promised. One by one, we are keeping the promises I made to the American people during my campaign for President … Therefore, in order to fulfill my solemn duty to protect America and its citizens, the United States will withdraw from the Paris Climate Accord but begin negotiations to re-enter either the Paris Accord or a really entirely new transaction on terms that are fair to the United States, its businesses, its workers, its people, its taxpayers. So we’re getting out. But we will start to negotiate, and we will see if we can make a deal that’s fair. And if we can, that’s great. And if we can’t, that’s fine. Not only does this deal subject our citizens to harsh economic restrictions, it fails to live up to our environmental ideals. As someone who cares deeply about the environment, which I do, I cannot in good conscience support a deal that punishes the United States — which is what it does -– the world’s leader in environmental protection, while imposing no meaningful obligations on the world’s leading polluters. For example, under the agreement, China will be able to increase these emissions by a staggering number of years — thirteen. They can do whatever they want for 13 years. Not us. India makes its participation contingent on receiving billions and billions and billions of dollars in foreign aid from developed countries. There are many other examples. But the bottom line is that the Paris Accord is very unfair, at the highest level, to the United States. Further, while the current agreement effectively blocks the development of clean coal in America — which it does, and the mines are starting to open up. We’re having a big opening in two weeks. Pennsylvania, Ohio, West Virginia, so many places. A big opening of a brand-new mine? It’s unheard of! For many, many years, that hasn’t happened. They asked me if I’d go. I’m going to try. In short, the agreement doesn’t eliminate coal jobs, it just transfers those jobs out of America and the United States and ships them to foreign countries. We have among the most abundant energy reserves on the planet, sufficient to lift millions of America’s poorest workers out of poverty. Yet, under this agreement, we are effectively putting these reserves under lock and key, taking away the great wealth of our nation — it’s great wealth, it’s phenomenal wealth. Not so long ago, we had no idea we had such wealth — and leaving millions and millions of families trapped in poverty and joblessness. The agreement is a massive redistribution of United States wealth to other countries. At 1 percent growth, renewable sources of energy can meet some of our domestic demand, but at 3 or 4 percent growth, which I expect, we need all forms of available American energy, or our country will be at grave risk of brownouts and blackouts, our businesses will come to a halt in many cases, and the American family will suffer the consequences in the form of lost jobs and a very diminished quality of life. The United States, under the Trump administration, will continue to be the cleanest and most environmentally friendly country on Earth. We’ll be the cleanest. We’re going to have the cleanest air. We’re going to have the cleanest water. We will be environmentally friendly, but we’re not going to put our businesses out of work and we’re not going to lose our jobs. We’re going to grow; we’re going to grow rapidly. I’m willing to immediately work with Democratic leaders to either negotiate our way back into Paris, under the terms that are fair to the United States and its workers, or to negotiate a new deal that protects our country and its taxpayers. So if the obstructionists want to get together with me, let’s make them non-obstructionists. We will all sit down, and we will get back into the deal. And we’ll make it good, and we won’t be closing up our factories, and we won’t be losing our jobs. And we’ll sit down with the Democrats and all of the people that represent either the Paris Accord or something that we can do that’s much better than the Paris Accord. And I think the people of our country will be thrilled, and I think then the people of the world will be thrilled. I was elected to represent the citizens of Pittsburgh, not Paris … Beyond the severe energy restrictions inflicted by the Paris Accord, it includes yet another scheme to redistribute wealth out of the United States through the so-called Green Climate Fund — nice name — which calls for developed countries to send $100 billion to developing countries all on top of America’s existing and massive foreign aid payments. So we’re going to be paying billions and billions and billions of dollars, and we’re already way ahead of anybody else. Many of the other countries haven’t spent anything, and many of them will never pay one dime. In 2015, the United Nation’s departing top climate officials reportedly described the $100 billion per year as “peanuts,” and stated that “the $100 billion is the tail that wags the dog.” In 2015, the Green Climate Fund’s executive director reportedly stated that estimated funding needed would increase to $450 billion per year after 2020. And nobody even knows where the money is going to! Nobody has been able to say, where is it going to? Of course, the world’s top polluters have no affirmative obligations under the Green Fund, which we terminated. America is $20 trillion in debt. Cash-strapped cities cannot hire enough police officers or fix vital infrastructure. Millions of our citizens are out of work. 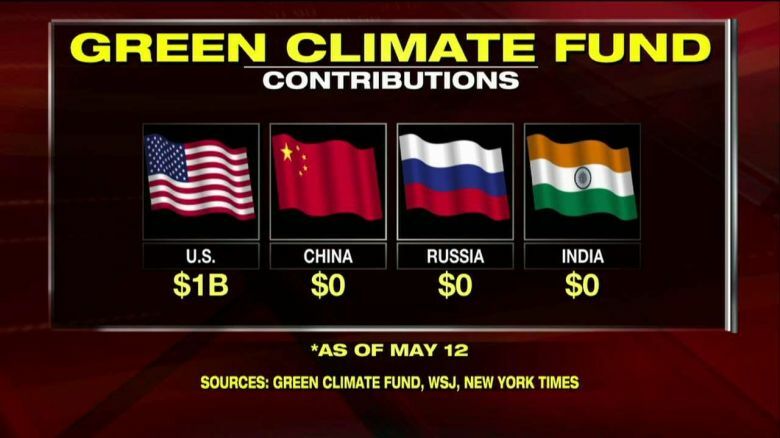 And yet, under the Paris Accord, billions of dollars that ought to be invested right here in America will be sent to the very countries that have taken our factories and our jobs away from us. So think of that. … The Paris Accord would undermine our economy, hamstring our workers, weaken our sovereignty, impose unacceptable legal risks, and put us at a permanent disadvantage to the other countries of the world. It is time to exit the Paris Accord and time to pursue a new deal that protects the environment, our companies, our citizens, and our country. The sharemarket is going gang-busters today following the news Trump is abandoning the Paris agreement. That’s really all I care about. You will have to play this one carefully, Jody. My advice is to hang in there until the moment before it peaks and then sell, sell, sell. How do you find that moment? Google . Or get hold of a good book on astrology. Good asa anything else. The shares in energy companies will indeed go gangbusters, until they stop going gangbusters and move into a more normal yo yo pattern. Yes, Ian, it’s a delicate balancing act. I call it “crystal ball factor”. But what is one to do when retired? Some say international shares, others say ‘don’t touch them as they’re subject to currency fluctuation”. I bought during the GFC when everybody was selling using Buffet’s logic “when people are frightened, you buy”. Right now it’s a difficult call because there are activists like Get Up who are proving very dangerous to the future of mining and its downstream industries (of which there are many, eg. Worley Parsons). The Paris Accord would undermine our economy, hamstring our workers, weaken our sovereignty, impose unacceptable legal risks, and put us at a permanent disadvantage to the other countries of the world. It is time to exit the Paris Accord and time to pursue a new deal that protects the environment, our companies, our citizens, and our country. Donald Trump has a lot of things to say about global warming. He’s called it an urgent problem, and he’s called it a hoax. He’s claimed it’s a scam invented by the Chinese, and he’s denied that he ever said that. Some environmental activists initially pointed to Trump’s unpredictable statements as evidence that he might not follow through on his campaign pledges to dismantle the Obama administration’s climate legacy. But just weeks after the 2016 election, one of his top aides assured Americans that Trump still believes climate science is mostly “bunk.” Indeed, Trump quickly signed an executive order rolling back key Obama-era limits on greenhouse gas emissions. And now he’s declared his intention to pull the United States out of the historic Paris climate agreement. Notice that he does not say today that venting megatonnes of CO2 into the air does not cause it to trap heat. We might have to wait a day or two for that one. Thanks for letting us know exactly what the President said; it sounded quite reasonable and rational. You won’t get that on MSM. This morning, listening to my daily dose of ABC News Radio all I heard was an interview with your friendly neighbourhood climate catastrofarian activist hyperventilating about Trump and the impending doom – nothing of substance about what Trump actually said, nor another view supporting the Trump decision. So much for “balance”. Climate change resulted in Turnbull losing the leadership last time. Dare we hope it can happen again? Now for Oz to find its Trump and do the same. Note that Vietnam is building 3 x coal-fired power stations to open by 2020-21, is upgrading its steel and cement manufacturing industries and its economy is going ‘gangbusters’ across the board. I noted that today the temperature was 1 degree above the average (in anticipation). We probably stole the heat from Oz. First world Telstra has blocked my email account as I am located in an embargoed region. Yet they still charge me for not being able to to use it. Fortunately, I have a Gmail account that bypasses them. 🙂 Golly and gee, what a surprise. Portland Vic is not the only smelter which is under threat when its contracted electricity price finishes in 2022. Tomago in Newcastle will also be on the line once Liddell closes, also in 2022. People have no idea. Here we have the AGL’s ads promoting the environment, and celebrating the eventual shut down of the power plant. Yet there is a real possibility of mass unemployment in the region as a result. Gladstone smelter has already had to reduce capacity by 15% because it could not get cheap enough electricity prices. This in Qld where there is abundant coal and coal-fired power generation. Here the state-owned generators have squeezed the market to improve their bottom line, the proceeds of which are siphoned off to the state government. You ask any player who has done serious modelling re Australia’s renewables and where the smelters fit in. It’s not just Portland that goes. It’s Tomago, Gladstone and Tasmania that they expect to fold. Because you simply cannot sustain them without coal-fired power. But to convince the world’s leaders to obey the math—to stop any new mines or wells or pipelines from being built—we will need a movement like the one that blocked the Keystone pipeline and fracking in New York and Arctic drilling. And we will need to pass the “Keep It in the Ground Act,” legislation that would end new mining and drilling for fossil fuels on public land. It’s been called “unrealistic” or “naïve” by everyone from ExxonMobil to the interior secretary. But as the new math makes clear, keeping fossil fuels in the ground is the only realistic approach. What’s unrealistic is to imagine that we can somehow escape the inexorable calculus of climate change. As the OCI report puts it, “One of the most powerful climate policy levers is also the simplest: stop digging.” That is, after all, the first rule of holes, and we’re in the biggest one ever. This is literally a math test, and it’s not being graded on a curve. It only has one correct answer. And if we don’t get it right, then all of us—along with our 10,000-year-old experiment in human civilization—will fail. Ian , you cannot make a bicycle without energy from coal,gas,or nuclear,keeping the fossil fuels in the ground means going back to the stone age,the stone age people at least burnt wood to keep warm and cook their food. You have no idea what it takes to live in the modern world. And you have zero idea of my qualifications, background and experience. The Earth has a store of fossil carbon that has to last humanity forever. And ever. Amen. Its best use IMHO is for road tar and as feedstock for the chemicals industry. But since about 1750, we have been feeding it into furnaces for power generation and steel making in the main. There are alternative ways of producing both that do not involve increasing the load of heat-trapping gases in the atmosphere. You carry on as if the fossil carbon will last forever. Sorry I have to be the one who tells you this, but it won’t. Not by a long shot. Maybe 200 years’ worth at current rates of combustion, PROVIDED we are prepared to ignore the side effects, like melting of the world’s glaciers and polar ice in the long thaw, and the resultant sea-level rise. Eventually, if you want to take in a performance of The Pearl Fishers at Sydney opera House, you will need scuba gear. And Malcolm Turnbull’s harbourside mansion will have problems of rising damp, and will be going cheap. Ian, the only western economy that has successfully reduced CO2 emissions beyond what is merely due to moving heavy industry to China and India, is the USA, due to development of its massive gas reserves that were formerly locked in tight shale. Hydrocarbons to the rescue again, just as they saved the whale in times past. I’m impressed that you know how much potential hydrocarbon fuel supply is left in the world because nobody in the industry does. They keep having to revise their estimates upwards. (and that’s just “proven reserves” – do you even know what that means?) Luckily for those in China making wind and solar equipment to sell to the virtuous West, the required rare earth metals, iron and aluminium , and the hydrocarbons necessary for their smelters are unlikely to run out soon. Of course everything on earth and perhaps the universe is finite, as far as we know. But the simple fact from centuries of experience is that you can run out of “renewable” resources like trees a lot faster than mined resources. Just look at the rate of deforestation in countries with insufficient access to hydrocarbons that could fuel progress and prosperity. It’s only rich countries that can afford the indulgences and waste of greenie-ism. Have another read of what I wrote. Best news I’ve heard all day. With a bit of luck, we can keep coal mines, oil and gas wells going forever. Now all we have to adopt is the Ostrich School of Climatology’s approach to the AGW issue, and we’re home and hosed! Ian, I don’t think you got my point. I re-read what you wrote but you seem more intent on mockery than understanding. Coal mines, oil & gas wells will cease to become useful when something better comes along. That is most likely to happen long before supplies are exhausted. This exhaustion is not a sudden event, but a gradual one and will produce many surprises. For example, it was known for decades that there was more oil trapped in the Bakken shale than all of Saudi. But it wasn’t counted as a reserve because it was considered impossible to produce efficiently, if at all. The high oil prices of 2004 – 14 made it viable to develop this reserve and as more and more drilling and fracking was done, greater efficiencies resulted and the cost of extraction came down, so much so that much of it is still producing during the slump. It will only improve further. That’s before I even mention West Texas Permian and Eagleford and the huge gas supplies which have been unlocked. The only fuel source that is remotely in the ballpark as hydrocarbons for efficiency is nuclear. Way ahead of hydrocarbons for energy density, of course but nowhere near them for cost efficiency of energy delivery. Nothing’s forever, of course. And I’ve made enough money changing bearings on wind turbines in Europe to fully understand the meaning of “renewable”! Current Australian policies are attempting to force the issue pre-emptively by betting the house and our children’s future on two outdated, unreliable and grid-destroying means of energy conversion : wind and solar. They still can’t compete, so they are penalising coal especially to try and help them. The results have already been seen in higher prices, blackouts and business destruction and it’s only getting worse. The point you seem to be making is that better and more sustainable sources of energy need to be found. There are several points from this argument. First it is long term. So it would seem prudent to make the transition in a way that is not so destructive, especially for those people who have not advanced as afar as advanced economies today.What we are seeing instead is panic support of vested interests. The second point is about carbon. Short of nuclear fission and fusion matter is nether created nor destroyed. We can reasonable assume, without the need for further proof that there will be as much carbon in the world in 200 years time as there is today. Today’s panic is directed towards not using carbon at all. It is misguided. Third, you are mistaken regarding the effects of the AGW we have seen for two fundamental reasons. There is considerable doubt among scientists – depending on who you ask of course, because there is no consensus and they like anyone else respond to their own interests and the interests of their paymasters – that the effects of AGW are as you describe them. There is, quite simply not enough quality data available over the timescales required. And the complexities of the causes and effects of CO2 and other accuses of changes in temperature are sufficiently well understood within the system as a whole. the physics of parts of these mechanisms is known and the there are many scientifically sound hypotheses about others, but no empirically based proof of many and none whatsoever of the behaviour of the whole system as represented by models. I note, en passant, that it is actually mathematically impossible to solve the partial differential equations with so many independent variables they must be solved by making assumptions and many, many iterations of sets of input to see what happens. Today’s computers cannot do that so simpler deterministic approximations are made instead. Great store is set by the single parameter of climate sensitivity. Linear projections of this one figure produce alarming rises in temperatures only a few decades away. Good for PR and making a business and political case for more money or closing down capitalist industry but the truth is, and accepted by all, that the system is not linear and the feedback mechanisms that operate are not well enough understood to allow accurate projections of temperature rise when inputs, such as manmade CO2 emission, exceed levels not recently seen. this means that the green energy thrust, which is not a scientific but political and economic response to climate change is not secured on a sound scientific foundation. Were the response less drastic, moderate and clearly aimed at addressing the shortfalls in the foundation, there would be no controversy. But destroying what we have and so urgently (to be completed quickly so it cannot be reversed when the truth comes out?) on such a flimsy basis is wrong, economically and morally. We are already at the stage that so much political capital has been invested in the hypothesis of CAGW, that it may already be too late, to allow the truth to come out.there is a risk that the entire political establishment will be made to look really, really stupid, fraudulent, and untrustworthy. Imagine the backlash should that happen. Hence the wild and intemperate reaction to trump. And the complexities of the causes and effects of CO2 and other causes of changes in temperature are NOT sufficiently well understood within the system as a whole. Unfortunately there are millions like him. Busily sawing off the branch that supports them. Though my own Rhodesian accent has layers of English overlay, I thoroughly enjoyed Roger’s invitation to imagine the Donald’s declaration of withdrawal in Stine. So powerful was the exercise, I almost imagined Sir Malcolm Harbourside Mansion, announcing his solidarity with Donald in an equally magnificent, groundbreaking speech, as opposed to the pompous self defeating rubbish I heard on Sky News. In my imagination, Turnbull in fact repudiated Labour’s challenge for him not to capitulate in favour of the momentum created by the US withdrawal, for that in fact is what it is: a momentum of momentous proportions. But it is AMERICA’S withdrawal from the Paris agreement, not Trump’s, who is merely representative of the majority vote: a President fulfilling one of his core promises. All of a sudden all of the concerns I had of an Ivanka or a Jared Kushner undermining the President’s will on Climate Change dissolved, as possibly yet another example of CNN-driven fake news. And in a pure outburst of overblown rhetoric I began to feel the world was becoming a better place after all. Then I had to read Charles Wooley’s article in The Australian, where he compares militant Islam to an imaginary militant Christianity, and my landing was that much harder than I would have liked. I think I’ve put my back out. Warty, I read Wooley’s article too; that is until I threw up. I concur, Wooley by name, woolly thinking by nature. His version of the moral equivalency argument was as intellectually bankrupt as all the previous arguments. Not that the opinions of a 60 Minutes hack matter much. Oh, and go Trumpy! I too would love to see Halal Mal follow his example and exit us from the merde of the Paris Accords. Fat chance of course. A snowball’s chance in a global warmist’s hell, in fact. President Trump, with all his quirky ways and idiosyncrasies, is the hope of the world. This decision of his could well signal the beginning of the end of the incredibly dishonest and none too intelligent climate alarmism scam. Considering the significance of the US relative to all other countries, their departure from the Paris Agreement will almost certainly cripple that unholy program. Without the billions of American dollars it will be seriously weakened and all the enthusiastic stay-in members will be unable and unwilling to make up the shortfall. With a little luck it will wither before very long, and not a minute too soon. Sinodinos’ insistence that sticking to the Paris Agreement “would do much to tame our high-and-forever-rising energy prices” is utterly bizarre. Introducing more uncontrollable renewables (wind and solar) will do completely the opposite: keep forcing up energy prices and reduce our energy stability, which will in turn enforce deindustrialisation and job losses. I’m sure you all noticed it, but there, in the middle of the article, in sound mind and body, with ABC-directed invective at hand, was our one and only Roger Franklin. ‘Twas not for him to lie down and take egg-in-face for an article we might all wished to have written. Not for him to pack up his bags, tail between his legs, to disappear without so much as a wave of the hand, despite the quisling behaviour of Nick Cater, on the Drum. But was it all a ploy? Did Keith write his grudging apology to the ABC through gritted teeth. Did Nick Cater half imply that Roger was half way to Timbuktu in order to give the ABC a taste of its own unchallenged fake news? We may never know . . . or, when the dust has subsided, Roger may once again take up his cudgel and lay about him in the name of Western Civilisation, against the Islamophiles crowding out the airways of Radio National. Hear, hear Warty . Let the Franklin satire stand. Franklin has reminded us of the literary possibilities of satire. We need much much more of this from the non-left literati which has been suppressed and dominated by the writers festival nausea of groupthink. A piece, for example on the children of feminist Islamists as to which way they may radicalise … perhaps a piece on the Green Left gender dream … a short essay on a homonormative society with zero population growth. I wrote a longer version of this response in the Catalaxy Files today http://catallaxyfiles.com Mixed responses, as one would expect, including the odd one with language that’d never appear hear, even in amongst some of the more heated debates. Here, not ‘hear’ (no edit button). Here, hear or hair. Whatever. Hear, hear Warty. Well said. Please read Clive James in today’s “Australian”. Compulsory reading. Oh dear, I don’t think Ian McDougall is going to like Clive’s article at all. Perhaps he doesn’t subscribe to The Australian, I don’t know; but were he to, there is no way he’d be able to avoid nose to nose contact with i,t as it is stuck right there under one’s very nossie. Wonderful article though. Clive is witty, prescient and intelligent. His essay isn’t a piece of casuistry it’s how a cadre of professionals can abuse language for their own political ends. And it speaks volumes about the tidal wave of sheep who willingly follow without question. Clive has spent his entire lifetime engaged with language and he understands the power of propaganda and agitprop. One of the most frightening things he said was “when the house of cards collapses you’re still left with the cards”. That’s an insidious idea not matter what the cultural battleground and wars. In my opinion, the stakes couldn’t be higher in the culture wars – of which climate is the front line of the infantry. There are plenty more marxist soldiers behind them. Here we go, Warty. Here we go. After reading Jody’s recommendation, yesterday morning I departed from custom and went and bought a copy of the Weekend Australian, just to read Clive James’ article Western climate alarmists will continue playing it cool . Blew $3.75. Mum was also an expert at making stews, and very expert at making salads. In fact I have yet to encounter better. Anywhere. Her potato salad was fit to die for. Sauce based on mayonnaise, oil, vinegar, spices and garlic. One would often encounter delightful surprises like the odd (then special delicacy) cashew nut, a piece of a tasty cheese, an anchovy or two, some highly spiced and flavoured tofu… etc. Like the threepenny bits (remember those?) commonly hidden in a Christmas pudding. I say this because we have here in Western climate alarmists will continue playing it cool by the inimitable Clive James, a verbal stew with a word salad on the side. One searches in vain through it for something meaty or something nutty – in the botanical sense of course. Ah yes. Unlike the disinterested and non-grant-dependent coal barons, the climatologists are just in it for the money. And ‘Climategate’, that worn out discredited nag is also led out for a little trot round the saddling paddock. When James is good, he is very very good. But when not so good, he can be verbosely so. I first learned in my early high school years about what physicists call ‘latent heat’, and that it takes 80 calories to turn one gram of solid ice at 0deg C to one gram of liquid water at the same temperature. While ever the Earth has ice at both geographic poles, that is where most of the heat it is absorbing will be going, or ‘hiding’, only to reappear as a steadily rising global ocean. It’s not rocket science. Ever since Malcolm Fraser, we have all known that life wasn’t meant to be easy. It is also true that Nature guards her secrets very effectively, which is why science developed so slowly, and in a way that at times has been “complicated.”. Science can be a hot kitchen. In my experience, Clive James in his literary journalism has two modes: 1: StF – serious to flippant, and 2: JtF – jocular to flippant. As I recall, the novelist Patrick White described him once as ‘a perpetual undergraduate.’ Not a bad way to be, in many ways. Pretty accurate re the JtF mode, but like the little girl and her proverbial curl, when he gets serious he is very, very seriously less JtF. He can go down as far as merely half JtF. On the same page of the Oz as the James piece we find an article by Graham Lloyd on the current (AGW related) problems of the Great Barrier Reef. Could be that The Oz is having two bob each way. Or that its right hand does not know what its left hand is doing. That is, if “Australian” = ‘The Australian’. Well, was he right or wrong? From Watts Up With That the world’s most viewed site on the science of global warming/climate change. I recast Willis’ first graph as a bar chart to make the concept easier to understand to the layman:From Watts Up With That the world’s most viewed site on the science of global warming/climate change. Lo and behold, the first 20 ppm accounts for over half of the heating effect to the pre-industrial level of 280 ppm, by which time carbon dioxide is tuckered out as a greenhouse gas. One thing to bear in mind is that the atmospheric concentration of CO2 got down to 180 ppm during the glacial periods of the ice age the Earth is currently in (the Holocene is an interglacial in the ice age that started three million years ago). Plant growth shuts down at 150 ppm, so the Earth was within 30 ppm of disaster. Terrestrial life came close to being wiped out by a lack of CO2 in the atmosphere. If plants were doing climate science instead of us humans, they would have a different opinion about what is a dangerous carbon dioxide level. Some of the IPCC climate models predict that temperature will rise up to 6° C as a consequence of the doubling of the pre-industrial level of 280 ppm. I have much more evidence but will leave it there for the moment. What I and my family, and all our friends want from you is the scientific evidence that you are using to justify a dramatic fall in our economic competitiveness and an equally dramatic fall in our standard of living. We should have the cheapest power in the world. It is near the most expensive. WE WANT ANSWERS. That is your duty. There was supposed to be a graph in there of the logaritumic effect of carbon dioxide. The lst paragraph was not intended to be there. When I see anything with the word “predict” in it I become suspicious, then I shut down. You don’t believe in predictions? It’s no bloody wonder yours are always wrong. You made a prediction that Trump would be removed as President and staked $1,000 on it in a bet with me. Apart from three new COAL-fired power stations, Vietnam has just approved the building of a Korean financed chemical manufacturing plant employing 2,500 workers. Everything is growing here, wealth is visibly increasing yet by comparison ‘Venezuelan’ Oz is in terminal economic decline caused by energy poverty. And the MacD will celebrate the end as a win. How’s that saving the world by losing your sovereignty and impoverishing yourselves working out for you folks? Adani have approved the Carmichael mine project. Best news this nation has had for a long time. Poor old Ian M. The world must surely be about to end.